Completely remodeled, Cape-style, two bedroom, waterfront, vacation cottage in Eastham, Massachusetts, available for weekly rentals during peak summer season. Enjoy our private freshwater beach including the use of rowboats, dock, and swimming platform! Relax and enjoy the beautiful views of the 21-acre Minister Pond from the large, well-appointed living room. Our cottage (named the 'Cast Off,' which means 'to let go') is located in a private location (Cottage #7) in the Nauset Haven community and positioned in close proximity to the Cape Cod National Seashore with all its great beaches. Also close are the many beaches of Cape Cod Bay, as well as restaurants and shopping in Eastham, Orleans, Chatham, Wellfleet, and other great Cape Cod towns! Our cottage has all the conveniences of home (and then some) in a lovely Cape setting. Rinse off or clean up in our new outside shower while overlooking the pond. My wife and I had a wonderful, relaxing two weeks at the Cast Off cottage. It’s very comfortable, fully equipped and has a beautiful view of Minister’s Pond. It’s also in an excellent location, close to National Seashore and bay beaches, historic lighthouses, fishing (in the pond and ocean), the Cape Cod Rail Trail and a variety of great places to eat. The new fireplace provided a lot of atmosphere as well as warmth on chilly October nights. We’ll be back! Great house for our family of four! We had a wonderful week. Wish the weather had been a bit warmer to enjoy the pond more, but we sure had fun when we could get in it. House was clean and comfortable and had everything we needed for the week. Thank you! Cast off cottage is a large, charming, well equipped, very clean, place with a beautiful view of the pond from almost every window and wonderfully decorated. The difficult part for us, we are over 70 , is the 40 yard or so distance , on an incline from the car to the house. If that was noted somewhere we missed it. Respectfully mention that the sofa and chair need some improvement for better comfort. Would like to have used the dock, but again, the access, was to step on one, half submerged cinder block to get to it. Had a lovely time with our daughters present and poor weather despite our negatives. We had a wonderful time. It was almost everything we had hoped for. My husband and I honeymooned on the Cape and have been going back every year for our anniversary - 19 years now. This cottage was by far the best place we've stayed. It is very clean and decorated perfectly. It felt so warm and comfortable and we were able to relax and enjoy the calming view of the lake. I love to cook and was very happy to find everything I needed in the kitchen. My husband loved to get up early and go fishing off the dock, catching bass and pickerel. It rained all weekend so we weren't able to take advantage of all of the outdoor amenities but are looking forward to enjoying them on our next stay which will hopefully be sooner than next year! If you like to see beautiful beaches you want to stay in Eastham. Close to the national seashore. Nausset light beach is easily one of the top 5 beaches I have ever seen, and I have been to Hawaii, Aruba, Cancun, and the Bahamas. 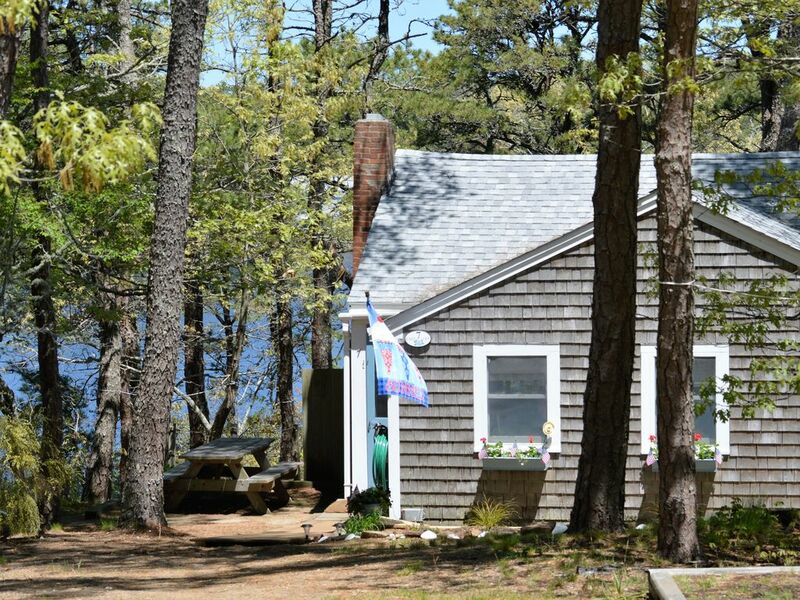 Our Cottage is conveniently located on the best part of Cape Cod! Our cottage is located right next to the entrance of the National Seashore and all the beauty it has to offer -- huge sandy beaches, fantastic nature trails, Nauset Lighthouse, and more! Beaches and activities on Cape Cod Bay are also close. Bike paths are right next door. Great restaurants and shopping just down the road. A short 20 minute drive north and you can visit Provincetown where you can enjoy whale watching. A 15 minute drive south and you can be in downtown Chatham. But why leave when you have your own beach right outside your door!